As we take a close look at this blooming cactus, we first notice the spikes and the complimentary colors of the red flowers emerging from the green cactus body. The sunlight and shallow depth of field give us excellent clarity. A close look at the sunlit blooms on the cactus. Those spikes look sharp! But then we notice the delicate spider web illuminated by the sun. Where is the spider, who lives in symbiosis with the cactus, not at all discouraged by the sharp spikes? Just outside my back door, I found fraternal twins on my hydrangea bush: a pink and a blue blossom on the same plant. All the rain in the past few weeks are helping the blossoms last. Stay away, hungry deer! Fresh pink and blue blossoms on my hydrangea bush. Shot with Nikon D800, at 1/500 second, f 2.8 and ISO 100. Shallow depth of field gives the photo an intimate feeling. The hydrangea may be my favorite flower, thanks to associations with my daughter’s June wedding as well as memories of seeing them on Cape Cod. Chihuly glass sculptures, installed in many prominent American botanical gardens, ostensibly aim to imitate nature. How do you compare these sublime towers of glass at the New York Botanical Gardens to a nearby stalk of blooms? Chihuly’s yellow and red spire of glass spokes stand in stark contrast to the round pavilion at the New York Botanical Garden. Inside the neoclassical pavilion, I found this simple and elegant stalk of blossoms. It is rather understated, you might say, but similar to the sculpture in its overall shape and repetition of blossoms up the stalk. Here the colors are more muted, not bold, primary colors the sculpture has. Close up of delicate blossoms emerging symmetrically around the plant’s stalk at New York Botanical Garden. Inside the pavilion shown in the first photo is a more fanciful Chihuly tower sculpture that reminds me of a Dr. Seuss illustration. It is white with pink polka dots, and its spokes curl like snakes. Symmetry is no longer the operative word. We might say this piece shows more personality. Polka dots and irregular curls give this Chihuly sculpture a different personality. New York Botanical Garden, inside the pavilion. My own hydrangeas around my house won’t bloom until the end of June, but a visit to the Phipps Conservatory in Pittsburgh allowed me to dream of a summer day. This early blooming hydrangea reveals delicate shades of yellow and blue at Phipps Conservatory. Does the lush hydrangea bloom evoke memories for you? A daughter’s wedding? Or perhaps a summer vacation in Cape Cod? 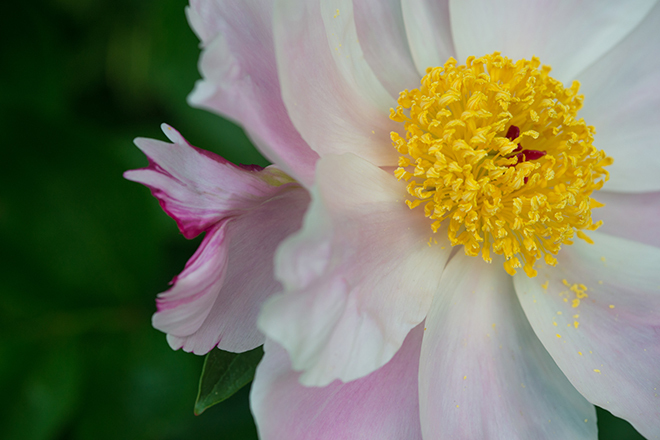 Macro photography lets you take a careful look at a flower’s center. I also find that the irregularity in a flower makes it special. I was attracted to the darker pink streaks on the petal in the back. In this image, I find my eye is first drawn to the delicate yellow tendrils of the flower’s center. In the asymmetrical composition, that yellow center needs a counter weight, which the fascia-streaked petal provides. Does your eye move the same way? Is your vision attracted to color changes, defined detail and edges? Today I found something very delicate and beautiful in my own back yard.